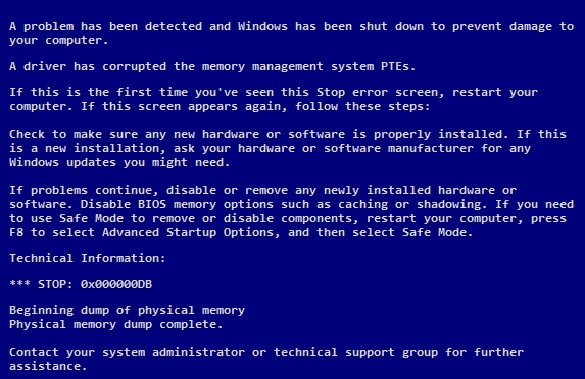 The DRIVER_CORRUPTED_SYSPTES Blue Screen of Death error has a STOP CODE of STOP ERROR 0x000000DB or STOP 0xDB for short. The error usually occurs in a system with drivers with corrupted system PTEs. The error occurs when a driver attempts to access a page able or invalid memory at an extremely high IRQL. Solving this error starts with updating windows and then identification of the source of the error. First, install the most recent Windows Update. To do this manually open Internet Explorer, click Tools and choose Windows Update and follow the instructions given. On the identification part, the first possible sources of error considered are recently installed drivers or software. Try uninstalling them and reboot the system. If the error stops, then find an updated or stable version of the software that is compatible with your system and install it instead. If this does not fix the error, then other drivers can be the cause. The driver causing this error can be determined using an added tracker in the registry. This is done by accessing and editing the registry By going to Start then run and typing in “regedit”. Once there, navigate to \\HKEY_LOCAL_MACHINE\SYSTEM\CurrentControlSet\Control\Session Manager\Memory Management and create a new DWORD value named TrackPTEs and set its value to 3. If the DWORD value already exists, simply change the value to 3. After the change is complete, reboot the computer. This will issue the system to save stack traces that performs the bug check 0xDA (SYSTEM_PTE_MISUSE). The stack trace will then identify the driver where the error originated. The next step would be to uninstall the driver and install an updated version of the driver. However, if the error continues to surface, then simply change the driver version back to its original working version: uninstall the current version and install the previous working version. If you would like to remove the guess work you can use Driver Reviver to update and manage all of your drivers for you.